As it gets closer to midterm season, it can be impossible to find an empty space at the Main Library or Mudd. Studying alone in an empty classroom inside the maze that is Tech? Absolutely terrifying, especially if you’re a non-engineer. It’s pretty hard to study somewhere that's not your usual spot, but a change of scenery may be just what you need. And if it happens to be outdoors? Even better. Tech is a magical place: If you're in STEM like me, you might walk in for your 9 a.m. and not leave until the sun sets. Zombified students fill up on coffee and Monster, but walk past these students banging their heads trying to get their codes to run, and make your way through the double doors next to Tech Express. You’ll find yourself in something like an oasis. Sit down at any of the six picnic tables and surround yourself with greenery; the umbrellas provide the perfect shade to work. The only downside to this spot? The occasional cigarette smoke that wafts by as students and professors light up, side by side. 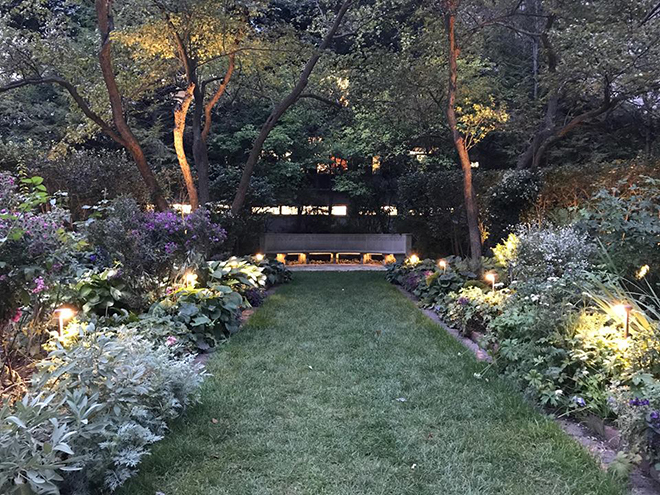 Tucked between Ford and Dearborn, this “Secret Garden” is hidden in an obscure area of campus. It’s peaceful and quiet, with only the occasional chirps of bird breaking the silence. A certain sense of serenity emerges, wiping away the construction on Sheridan Road and impending sense of midterm doom. 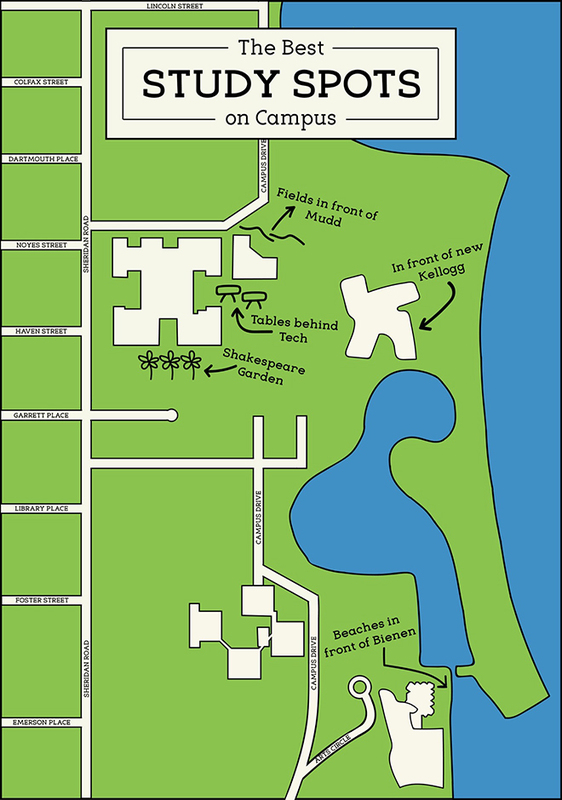 The majority of bushes, flowers and trees in the garden are all mentioned in Shakespeare’s works, and make this spot a perfect study break: walk around and try to match the plants to the Bard. It’s unlikely to see anyone else wander through during a study session, which makes it the perfect place to work undisturbed. Going green has never been so productive. 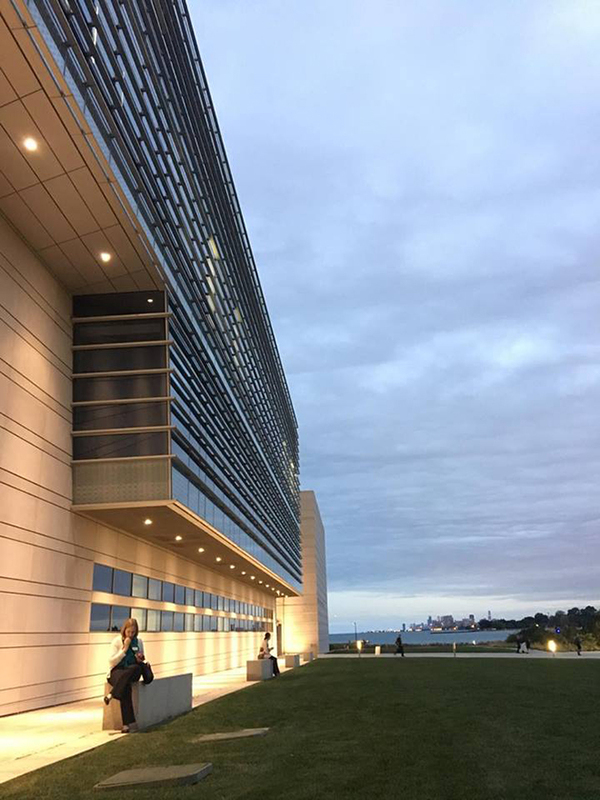 It is undeniable that the new Kellogg Global Hub is beautiful. 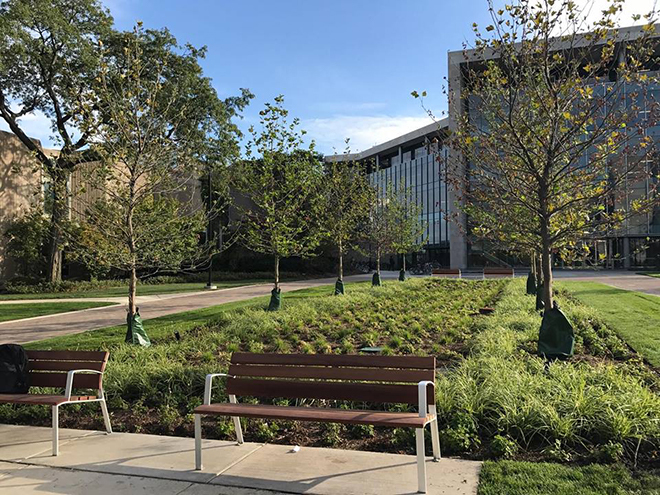 Right outside the Global Hub, directly across Norris is a seating area, called the Montag Vista, that works as a great outdoor study spot. On a clear, sunny day, Chicago appears between the trees to the south. Even if it’s cloudy, you can still get great views of Lake Michigan, and the wind from the lake will provide a slight breeze. But be careful studying there late at night – after 8 p.m. on weekdays, buildings require an authorized Wildcard, and it’s quite a trek to the nearest bathroom. 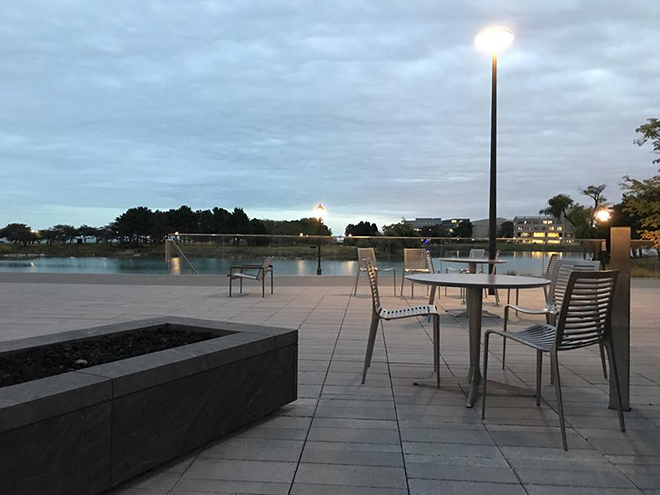 While it’s open, it’s definitely one of the best outdoor study spots on campus. Breathing in fresh air can work wonders after being inside all day for lectures. Unfortunately, the two rows of trees planted in aesthetic rows are too young to lean on as you power through some accumulated readings, or even to provide with decent shade. Nearby, however, is another trapezoid-shaped field with a big tree in the middle, which provides just enough shade to read under. The two fields are small, but they’re definitely a more original and less crowded than the Lakefill or Deering Meadow. The field is also the perfect distance from everything on North Campus. If you end up missing air conditioning, Mudd is right there. The walk to the bathroom, though, is a different story. Commonly known as the S.S. Bienen, this z-shaped building looks like a ship against the backdrop of the lake. 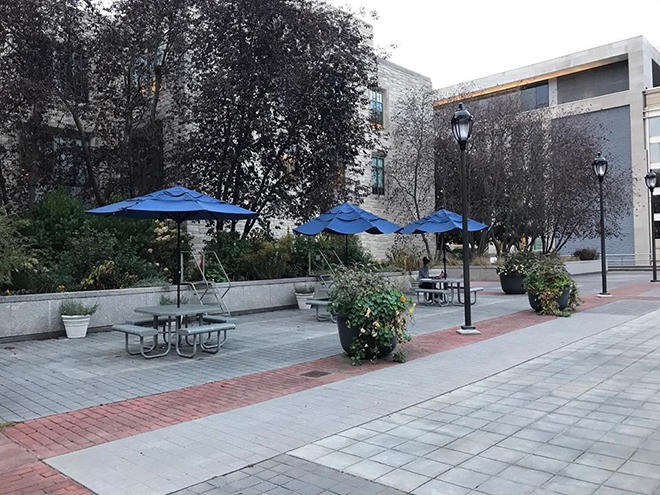 The minimalist stone benches outdoors may not be the most comfortable for long periods of time, and the lack of a table might make it hard to write that paper for your class, but the view makes up for it. Or, you can opt out of the benches and instead sprawl on that perfectly manicured grass and look up at the blue sky.